Fr. Collins Park is Ireland’s first wind powered and wholly sustainable park, and was designed by the Argentinian architects Abelleyro & Romero. It has the capacity to be entirely energy self-sufficient with five wind turbines that harness the wind and provide the energy that powers the park’s lighting, aeration and water features as well as the maintenance depots and sports changing rooms. 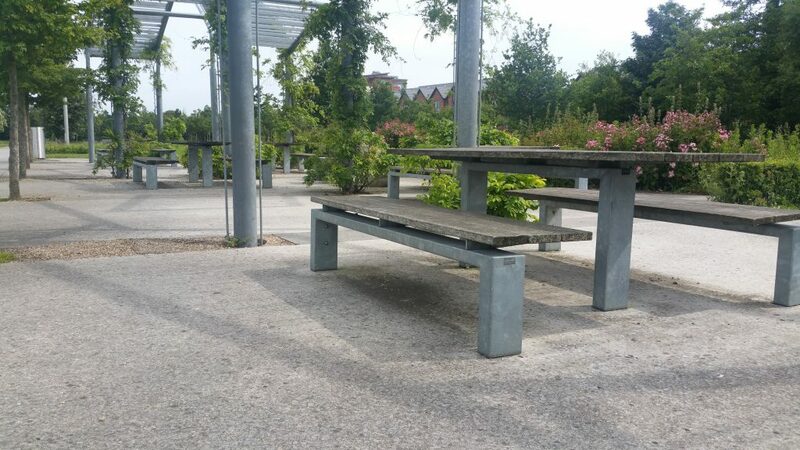 The park has since won a number of awards such as The Sustainability Award 2010, Best Public Space 2010, and Best Public Park & Best Environmentally Friendly Initiative for 2010 and was short listed by the European Union Prize for Contemporary Architecture 2011. 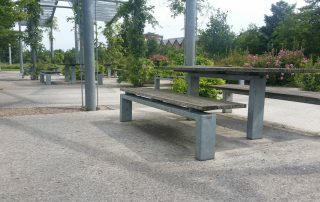 The approximately 54 acres (or 26 hectares) encompasses some natural woodlands, a 1.5 km peripheral running/cycling track, six playing pitches and six fitness stations, a promenade, a concert amphitheatre and picnic areas with outdoor chess/draughts boards, and two playgrounds and a skate-park. It also includes sustainable features such as wetlands which treat and store surface water from the park to prevent run-off, and a green roof on the sports pavilion. A central part of the design brief was to establish in the population the awareness of the rational use of non-renewable natural resources, and to put the Dublin commune as a pioneer in the construction of self-sustainable public spaces, and respect for the environment. This required the use of construction materials that would provide low maintenance cost and great corrosion resistance over time. 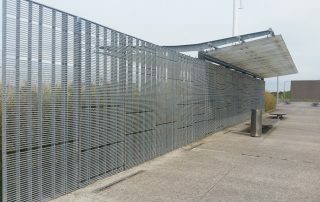 Hot Dip Galvanized Steel was used throughout the park for this precise reason. Firstly, it is a natural product, combing two of the earth’s most common elements, zinc and iron. More importantly, it’s toughness and durability mean that it can deliver a maintenance free life far in excess of the normal 50 years design life. The Hot Dip Galvanizing standard I.S. EN ISO 1461: (2009), requires a mean coating thickness of 70 microns on 3-6mm steels and 85 microns on steels of 6mm and above. 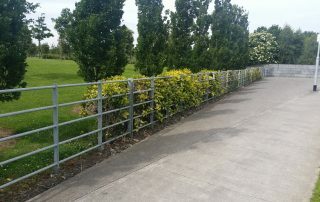 Atmospheric corrosion data obtained in the Zinc Millennium Map project of 2000, suggests an annual corrosion rate of 0.5 microns in the greater Dublin area, giving galvanized steel a potential lifetime of 140-170 years. On the 10th Anniversary of the park’s opening we thought it would be interesting to see how well the galvanized steel elements are performing. 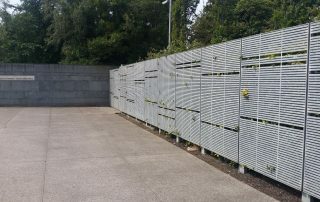 In order to do this, we carried out coating thickness measurements across a wide range of items including gates, railings, sun shades, screens and bridges. The results were amazing, with all readings still being well in excess of the required standard and many well in excess of 100 microns. 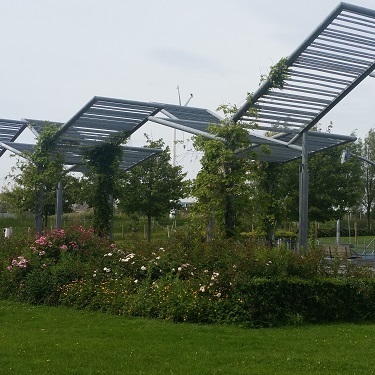 This is remarkable after 10 years and clearly demonstrates that the choice of Hot Dip Galvanized Steel has more than delivered on the design requirements. No maintenance will be required on most of this steelwork for the remainder of this century and beyond! 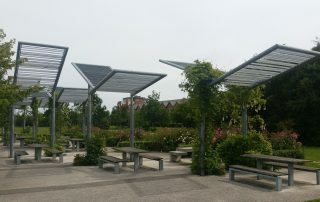 If the park is re-designed in the future or if for any reason the steelwork is no longer required, it can be easily taken down for re-use elsewhere or fully recycled. In the recycling process the zinc can be easily separated from the steel in the melting process and both the zinc and steel can be re-used without loss of their inherent qualities. 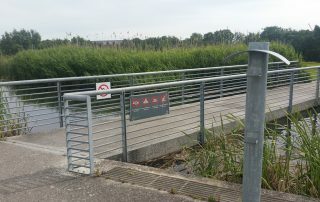 Declared a Statutory Nature Reserve in 1988, the inner estuarine part of the estuary and wetlands of Baldoyle Bay are of high significance protected as a Special Area of Conservation (SAC). They support several habitats that are listed on the EU Habitats Directive. Under the Ramsar Convention, it is designated as a wetland of international importance. Consequently, during the seasons of migration, the open lands of Father Collins Park continue to host migrating birds. Undisturbed lands remain an important refuge and hub for Arctic and European migratory birds. Of particular interest is the internationally important population of Brent Geese which inhabit the estuary.